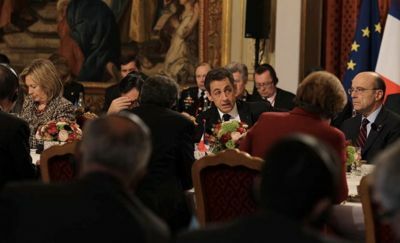 Hillary Clinton, Nicolas Sarkozy and Alain Juppé at the Paris summit on Libya. It has been said that truth is the first casualty of war. The Libyan military operations and Resolution 1973, which functions as their legal basis, are not an exception to the rule. These are presented to the public as a necessary measure to protect the civilian population against indiscriminate repression at the hands of Colonel Gaddafi. In reality they are classic imperial goals. Let us look at the following elements for clarification. To paint a black picture of the situation, the Atlanticist press pretended that the hundreds of thousands of people who were fleeing from Libya were doing so to escape from a massacre. Press agencies reported on thousands of deaths and spoke of “crimes against humanity“. Resolution 1970 referred to the Prosecutor of the International Criminal Court “the widespread and systematic attacks against the civilian population“. In fact, the Libyan conflict can be read both in political terms and from a tribal perspective. Immigrant workers were the first to fall victim, being brutally forced to leave the country. The clashes between Gaddafi’s supporters and the insurrection have certainly been bloody, but never in the purported proportions. There has never been a systematic repression against civilian population. During his speech before the Security Council, French Foreign Minister Alain Juppé sang the praises of the “Arab Spring” in general and the Libyan insurrection in particular. His lyrical speech cloaked dark intentions. Juppé didn’t utter a single word about the bloody repressions in Yemen and Bahrain, yet he paid tribute to King Mohamed VI of Morocco as if he were one of the revolutionary agents of change  thus contributing to worsen France’s already disastrous image in the Arab world thanks to the President Sarkozy. Since the beginning of these events, France, Great Britain and the United States have persisted in denying the fact that this is a West-sponsored war, although French Interior Minister Claude Guéant did refer to Nicolas Sarkozy’s “crusade” . The three countries in question brought into play the alleged support from the African Union and from the Arab League. In reality, however, the African Union condemned the repression and recognised the legitimacy of the democratic claims but invariably pronounced itself against a foreign armed intervention . As for the Arab League, it must be noted that its members are mainly regimes threatened by similar revolutions. While they embraced the principle of a Western counter-revolution – some of them are even actively taking part in it in Bahrain- they could not afford to back an outright Western war for fear of precipitating the opposition movements likely to overthrow them at home. There are three rebellious regions in Libya. A National Transitional Council was constituted in Benghazi; it then merged with a Provisional Government set up by Gaddafi’s Minister of Justice, who subsequently aligned with the rebels . According to the Bulgarian authorities, this is the same character who arranged for the torture of the Bulgarian nurses and the Palestinian medic that were held by the Libyan regime for an extended period of time. By recognizing the Libyan National Transitional Council and absolving its new president, the Western coalition picked their own interlocutors and foisted them on the rebels as their leaders. This enabled the coalition to weed out the revolutionary nasserists, khomeinists and communists. The coalition’s aim was to be ahead of the game and avoid what had happened in Tunisia and Egypt when they imposed a government tied to the official Party without Ben Ali or a Suleiman government without Mubarak, both of which were also ousted by the revolutionaries in the end. If the objective were to protect the population, the embargo would have been crafted to target the mercenaries and the weapons funneled to the Gaddafi regime. Instead, the embargo was extended to the rebels to prevent any possible victory. Therefore, this is obviously about stopping the revolution in its tracks. If the objective were to protect the civilian population, the no-fly zone would have been limited to the rebel territory (as was done in Iraq with Kurdistan). In fact, the restriction affects the entire national territory. In this way the coalition hopes to maintain the balance of power between the forces on the ground and divide the country in 4 areas: the 3 rebel areas and the area loyal to Gaddafi. This de facto division of Libyan territory goes hand in hand with the one in Sudan and the Ivory Coast, which mark the first stages of the “Remodeling of Africa”. If the objective were to protect the civilian population, only the personal assets of the Gaddafi family plus those belonging to the regime’s dignitaries would have been frozen to prevent them from violating the arms embargo. But the freeze has also been enforced against the assets of the Libyan state. Now, it just so happens that Libya – a wealthy oil-producing country – possesses considerably large assets, part of which are invested in the Bank of the South, an institution dedicated to the funding of projects in the Third World. As pointed out by Venezuelan President Hugo Chavez, freezing the assets will not protect the civilians. The real aim here is to re-establish the monopoly of the World Bank and the International Monetary Fund. If the objective were to protect the civilian population, the organisation in charge of implementing Resolution 1973 should have been the UN. Instead, the military operations were being coordinated by the US AfriCom and currently by NATO  It was precisely for that reason that Turkish Foreign Minister Ahmet Davutoglu was incensed at the French initiative and requested an explanation from NATO.